That has got to be the most ridiculous exchange of dialogue I've ever seen. Never in my life did I think I'd see a gorilla smite a butter monster with his fist of communism, and yet, here we are. Good god, I want to play this game so bad. "First, we have aspirin. A common cure for things that aspirin cures. Leads to.....rabies." Could we have some screenshots? I'd love to see if the Butter Monster evolved/devolved in a different beta version. We can all save this trouble if he would kindly sell it to me. The person who owns this DOES NOT plan on selling it from his email to me. Now, a few things to get across before anyone jumps to conclusions. I WILL get this game dumped for everyone to play if he decides to sell it to me ever. I would like the game, and I know everyone else would love to see this game away from the bit rot sty. Other things of note. The people who are comparing "dumped" games values in comparison to an NWC and even "Stadium Events"???? COME ON. Get real. It's supply and demand here. California Raisins umdumped would have fetched $3K, and dumped it fetched around $500. The prominent collectors (including those involved with community dumps) are not stupid, and will NOT pay anywhere near the same amount of a game they can copy from the web and download onto a cart. If you come up with the argument that collectors will ALWAYS want the real thing, take myself, Nintendo God, and Buyatari for example. I just want the game on a cart to play. I'll pay a fair amount for the cart, but I am not overpaying at ALL for anything dumped, copy or not. Prototypes are all copies of copies anyway. With that said, if you have never owneed an unreleased prototype, or see the value go up and DOWN like i have had with experience for the past few years, please stay out of this, k thx. Please Paul, go back to showing off that great find! Honestly, i just put the title in google, and a store poped up offering it... I did order it, but i wouldn't be too disapointed if it doesn't show up. I don't collect NES games, I only have a few dozen. If on the other hand, it does appear in my mailbox someday, then of course screenshots a-plenty. Oh christ, if they guy doesn't want to sell it then respect his wishes. I think that its really lame to try to guilt him into selling it to you by bringing your negotiations and ultimate plans for the game into the public eye. Nintendo God offered $2k, which was as far as both the owner and I were aware, the highest offer. If you know of someone who offered $3k, you should explain. Griking: Get a life, please. I am mentioning that because everytime I place my name somewhere, it's either I am going to "horde" the game, or whatever. Also, "guilt" the owner? DId you not read my freaking post? My explanation was for the crowd that was a bit naive abotu devaluing. This is very far from you, and the owner knows I wanted to the game because I was the very first person to email him about it when it was posted. Paul, I am curious about the Butter Monster. Do you actually get to fight it in-game? Are those screens after you have defeated it, before you fight it, or is it an interactive cut scene where you get to control the ape's arm, sort of like how you have to spear your boat at Jaws in the NES game. You just kind of spear your fist into the buttery mass. You just kind of spear your fist into the buttery mass. Yellow, the new color for useful posts! Indeed, I must admit that suddenly I too have gotten the urge to - sometime within my short human life-span - smack a butter monster strongly with my fist. Dude, what if the Butter Monster IS Bio Force Ape? We've already seem him change radically in appearance once. Perhaps he degenerates into a blob of oozing, sentient butter by the end of the game, and when he dies we see the enemy's communist fists smashing him. That would all be very Kojima-esque. Hmm, flapjacks...IN SPACE? Campbell picks his source material well. 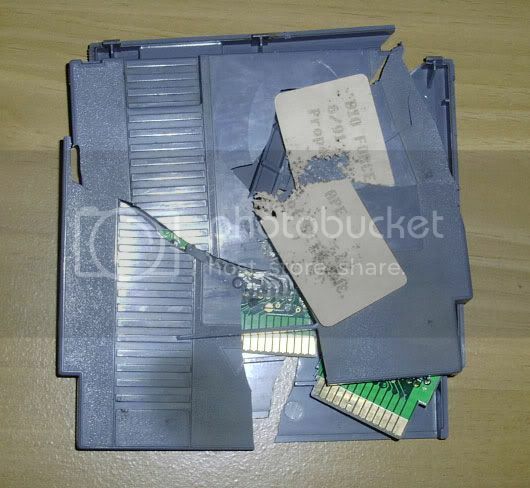 Having seen the anger that revealing this game's existence has caused, I have decided to destroy the cartridge. It is too powerful like that ring some midgets had to throw in a volcano. Please everyone calm down now. It was just a game. Quick, delete your post now!!! You may be the cause of 1,000,000 fatties crying out in pain, then suddenly silenced (for pulmonary reasons) a la the denizens of Alderaan. Couldn't you at least thrown it into a vat of liquid hot, bubbling butter????? Edit: Why won't my sig show anymore? I make posts in this forum at least once a year, I deserve a sig! Ya didn't have to do that you know. Outside of the few morons trying to force or pay you off for it to dump it, the rest of us were happy to see someone finding a proto like tha tin the wild, and finding out info on it. Well, at least you didn't dump it. Quick, somebody check Something Awful forums. Ha. The minutes of my life I will never get back reading/posting in this thread. Oh well. It was fun and interesting for what it was. Would've been better in April though. Could that possibly be saved?? Some Elmer's Glue or something? ?